Hot On The Trail Of Alien Moons : The Two-Way Astronomers have found about 2,000 planets beyond our solar system. Now, some scientists are expanding the search to look for distant moons, too, in the hunt for signs of life. 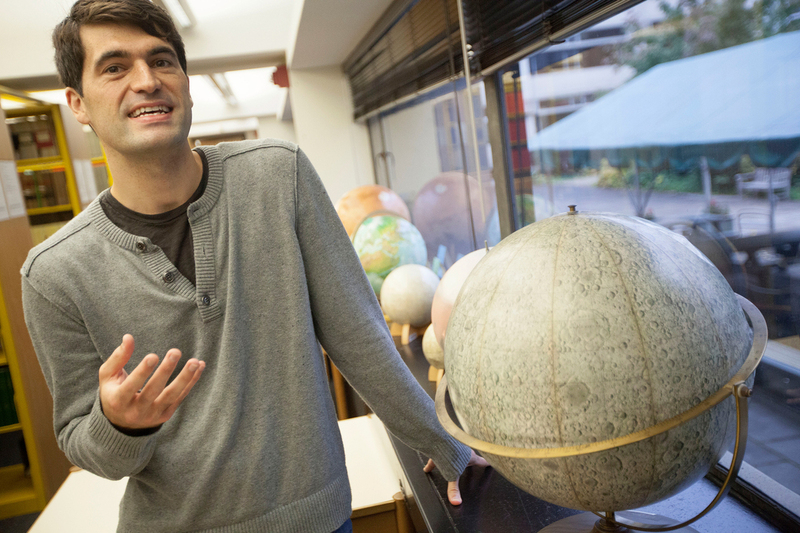 Columbia University astronomer David Kipping is extending the search for other planets — and their moons — to the extreme range of our detection abilities. David Kipping, an astronomer at Columbia University, says his team will use some new techniques and one of the fastest supercomputers in the world to survey around 1,000 planets. He expects the search to be detailed enough to catch even some pretty small moons, like the ones that orbit Jupiter. "If we have that sensitivity that we expect to have and we don't see anything, I would be very surprised," Kipping says. Finding the first moon outside our solar system would be a big deal — partly because when it comes to places that life could call home, moons may outnumber planets. Any alien life that's out there might well be on a moon. NASA's planet-hunting Kepler space telescope has revealed that around 2 percent of sun-like stars have a rocky planet orbiting in the region where temperatures are right for liquid water to exist. But there are five times more gaseous planets in that habitable zone — and those gas giants could be orbited by smaller, potentially habitable moons. "This question about the occurrence rate of moons is really salient to the question of whether we're alone in the universe or not," says Kipping. "Because it does seem that gas giants are at the right position for life more often than rocky planets." A couple of years ago, scientists reported that they might have found a moon orbiting a far-away, free-floating planet. But what they saw might actually have been a small star with a planet. And because of the technique used to spot it, astronomers can't be sure, Kipping says. "It's basically impossible to tell which of these two configurations is the real one," he says. "It's certainly not like the type of moons we have in our solar system." Can You Name These Moons In Our Solar System? 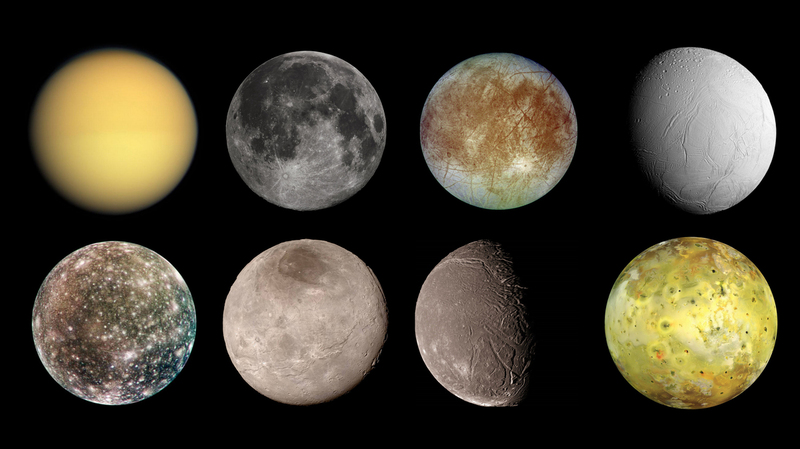 (Top row, left to right) Titan, Earth's moon, Europa and Enceladus. (Bottom row, left to right) Callisto, Charon, Ariel and lo. Kipping leads a small research team that's taking advantage of the data collected by Kepler to do a systematic search for moons. He first started thinking about how to do this around five years ago, he says, and his team's systematic hunt is the only one he's aware of. "I think it was seen as a little bit wild," Kipping recalls. Though he wasn't exactly mocked, he says, the general attitude of the astronomy community seemed to be " 'OK, fine, he wants to do that, but he's probably wasting his time.' "
The success of Kepler's planet hunting mission has made searching for moons seem less crazy. "Kepler has discovered planets that are as small as our own moon," Kipping notes. The Kepler telescope spent years staring at a bunch of stars, looking for little eclipses that meant a planet was passing in front of the star. Kipping and his colleagues are now taking each planet and analyzing exactly how it blocked starlight, searching for evidence that the planet was accompanied by a moon. "It's definitely very difficult," Kipping says. "But the payoff would be huge." Checking a single planet for a moon takes a ton of computing power, he says. "If you ran it on your laptop it would take you four years — of just letting it sit there for four years — before it would to be able to survey one planet." His team has surveyed about 60 planets so far, and found no moons. But they're getting better at the job, and now have access to more computing power. Rory Barnes, an astrobiologist at the University of Washington in Seattle, says the one question sure to be asked if and when the first moon is spotted is: "Is there life on it?" To have a shot at determining whether a moon that's light years away might be habitable, says Barnes, you'd like to see certain characteristics. "I'd certainly like to see a moon that is at least the size of Mars," he says. "When you get to that size, then you can start talking about moons that maybe hold on to an atmosphere for a long period of time." A telescope could potentially study that atmosphere and look for signs of living, breathing moon creatures. Life wouldn't be likely on a moon that's too close to its host planet, Barnes says, because such proximity can heat a planet up. For example, Jupiter has a nearby moon called Io, which is the most volcanically active body in the solar system. "There are weekly supervolcano eruptions on Io," says Barnes. "It's a really, really inhospitable place." Scientists may find moons so far out that they'll have to remain mysteries, because it will be too difficult to probe them in any way. Even in our own backyard, Jupiter and Saturn are circled by moons called Europa and Enceladus that are thought to have oceans. But whatever water might be there is hidden beneath miles of ice — for now, scientists can only wonder what might swimming around down there. "It could be that 100 years from now," Barnes says, "we'll know that the Earth is one of a handful of bodies in the solar system that is habitable and most of them are moons." The mere presence of a moon could also make a rocky planet more Earth-like, says Kipping. Our own moon controls the tides and keeps the tilt of our planet stable. Take away our moon, and our climate would go haywire. "We're lucky to have the moon," says Kipping. "I love looking up at the moon. It's lovely to look up in the sky and be able to see, with your own eyes, features of another world."